One of the reasons we went to Maui on our recent trip back to Hawai’i was to look for endemic birds. There are three species in particular on Haleakalā that I really wanted to see, and hadn’t seen before: the Maui ‘Alauahio (or Maui Creeper), ‘Akohekohe (or Crested Honeycreeper), and Maui Parrotbill (recently given the Hawaiian name of Kiwikiu). 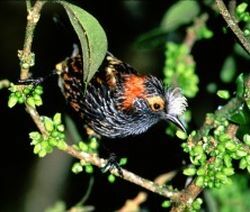 All three species are endangered, the latter two critically (there are perhaps 3,800 ‘Akohekohe and 500 Parrotbills remaining). 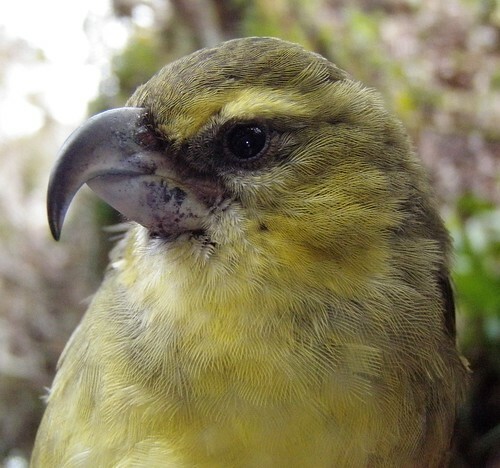 The Maui Forest Bird Recovery Project has a lot of info on these birds and their conservation. While the ‘Alauhio is fairly easy to see within Haleakalā National Park (at the Hosmer Grove campground), the other two species have a more restricted range. The best way to see these birds is to go on a hike into the Nature Conservancy’s Waikamoi Preserve, which is located just downslope of the north side of the park. Three of us went on this hike: myself, my husband Yan, and my cousin David. 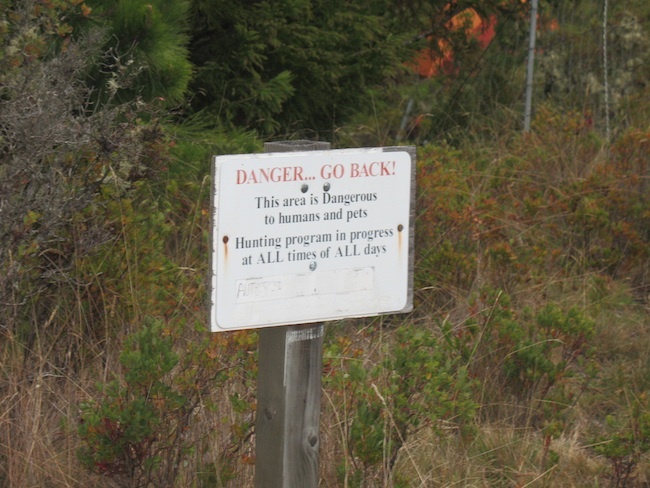 Surprisingly, no one else had signed up for the hike- this one is only offered once a month. 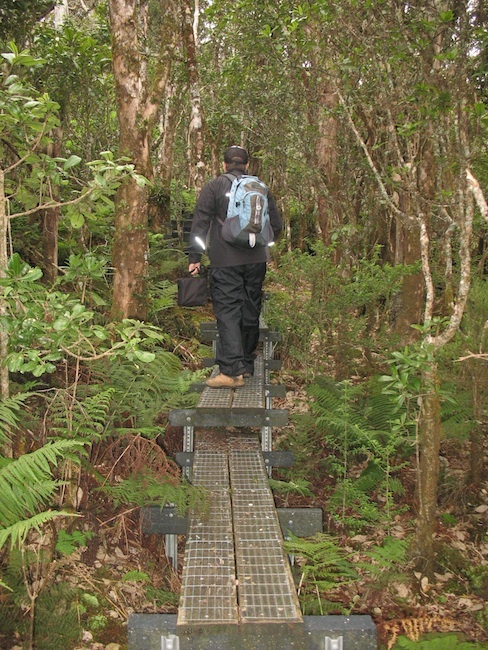 TNC offers guided hikes into the preserve in two locations: we opted to go on the Boardwalk hike, as we’d heard there was more of a chance of seeing ‘Akohekohe on this route (Parrotbills are much harder to find). The hike starts at about 6,800 ft, and descends about 1,000 feet. We’d been warned about cold and rain (it does descend into cloud forest), but the weather was pretty great. Given that the day after our hike a big storm system swept through and it poured all day in this area, we were pretty lucky. 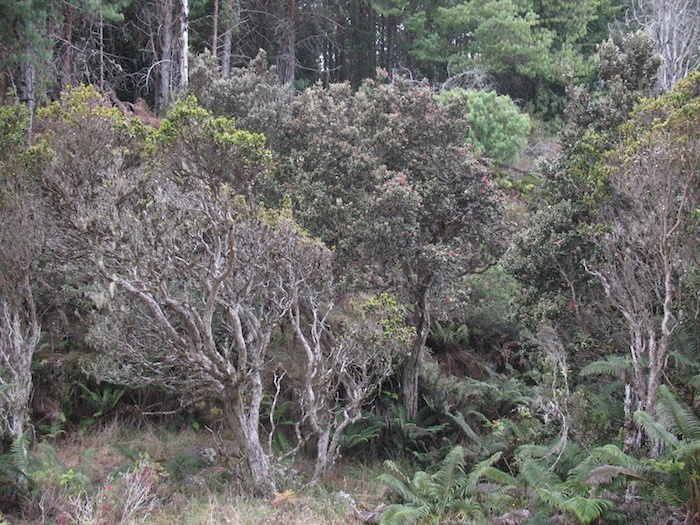 Throughout this area, you can hear the calls and whirring wings of the native honeycreepers: mainly ‘I’iwi, ‘Apapane, ‘Amakihi and ‘Alauahio at this elevation. It was definitely very cool! These birds are mostly restricted to high-elevation forest without mosquitoes, which carry avian malaria- a big reason they’re threatened. Some are nectar-feeders (the big poofy flowers of the ‘Ohi’a are a favorite) while others eat insects or seeds. It was interesting to see that they were able to use the alien parts of the forest for shelter, if not for food- I wasn’t expecting that. Once we got into the relatively pristine cloud forest, we saw a huge diversity of native plants- sadly, my native plant ID skills have eroded and I couldn’t identify many of them. The trail here goes on a boardwalk path that’s effectively a very long set of stairs. The ground here was covered with moss and ferns- an indication of the high level of rainfall. 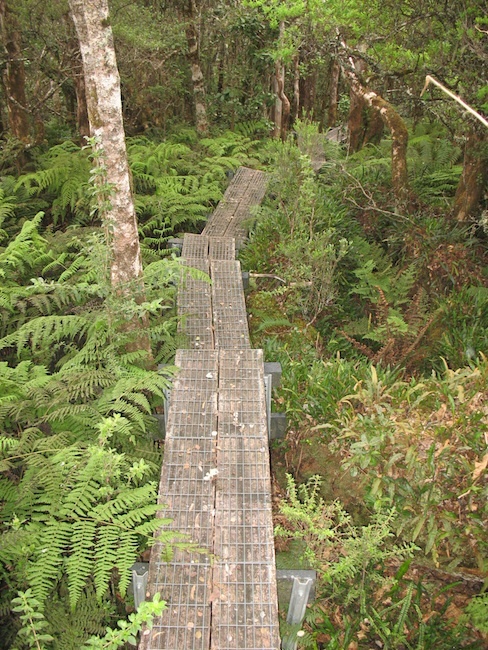 The boardwalk keeps damage to the forest floor at a minimum and provides solid footing. It was pretty damp. And, right as we got to the cloud forest, we saw four ‘Akohekohe! It was pretty cool- our guide, Michelle, was talking about the birds and the forest, and discussing how rare they were and how uncommon it was to see them. And then one-two-three-four: they landed on a tree behind her. Excellent timing. At the bottom of the boardwalk, there’s a platform and a seating area. On the rare non-cloudy days, there’s probably a great view from here to the ocean. We hung out here for maybe an hour, looking for birds and just listening to the total absence of human noise. Birds, insects, the wind in the trees: that is all you hear in this spot. David, going back up the stairs. Then it came time to go back up the trail. We knew that the rain front was rolling in- it was getting mistier and rain was starting to fall. It didn’t get completely foggy until we got back up to the top, though. The weather was excellent, overall. We never did see any Parrotbills, but that was a very slim chance anyway. I think the ‘Akohekohe is probably the most endangered bird species I’ve seen. And we saw several of them, with their cute little feathery crests. I’d been a bit worried about hiking at this elevation, after living at sea level for so long, but it wasn’t a problem. It probably helped that we’d been at the summit for a few hours beforehand, so the 5,000-ft drop to the trailhead made us breathe much easier. Overall, we got to spend several hours immersed in the sights, sounds, and scents of one of the most unique forests on the planet. This was truly a wonderful experience, and definitely made the trip to Maui worth it all by itself.